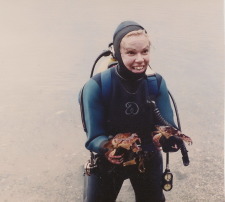 When I learned to scuba dive in the Pacific Northwest, it wasn’t a laidback, warm water experience. The environment posed the biggest threat so I’d don my 40 lb drysuit, heft my 25 lb weight belt, and pick up my 35 lb tank. Then I’d start the long descent to the beach. Adrenaline lightened my load as I anticipated sinking into the dark, frigid ocean. After an exhilarating, sometime dangerous, dive I’d surface and have to haul all that gear back to where I parked. As I picked my way across kelp-slippery rocks and up rough steep tracks, I’d tell myself not to look at the long stretch that separated me from my car. I’d get there, one step at a time. When did I forget that simple philosophy? Writing Down the Bones – Natalie Goldberg – I love her theories of free writing for a more physical connection with the work and to unearth long-buried feelings. Reading Like A Writer – Francine Prose – I had forgotten her invaluable advice on how to get the most out of the hours spent lost in fiction. A must for anyone who wants to write. Self-Editing for Fiction Writers – Renni Browne & Dave King – I wish I’d read this years ago. It gives such a different approach to revising one’s own work. Steal Like An Artist – Austin Kleon – this is my latest and I’m reading it for a second time this summer because he offers grounded, often humorous, advice on everything from an artist’s social life to his or her financial management. I found many treasures had been buried in my bookshelves for far too long. Now they are helping me as I revise my YA novel, due for release in Spring 2014. So, just like I climbed up the beach with my scuba gear, one step at a time, I’m working through them, page by page. In fact it’s almost Bird By Bird. Thank you Anne Lamott. It’s amazing how much we can do when we concentrate on what is in front of us and stop thinking about the faraway goal. What books are you reading to help your craft? Do you buy reference books, skim them, and then set them aside for another day? Are there any more books I should be reading?